MAU Workforce Solutions President Randy Hatcher is excited to announce the “Beat the President” contest, in which MAU Workforce Solutions employees will compete for prize money during the Cooper River Bridge Run in Charleston, SC on March 31st, 2012. MAU Workforce Solutions employees are gearing up for the race, in an effort to beat Hatcher’s race time, and win the prize money! “It is a great opportunity for my wife and me to spend time together as well as doing something healthy… We both feel great accomplishment completing the run,” said Regional Business Development Manager, Brian Callahan. 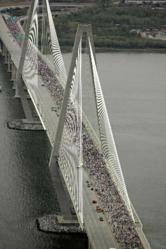 Callahan’s favorite part of the Cooper River Bridge Run is the view from the top of the Arthur Ravenel Bridge. Another MAU Workforce Solutions employee participating in the contest is Business Development Manager, Gary Plyler. When asked why he signed up to run, Plyler responded, “It is a unique way to see the beautiful sights of Charleston and keep fitness goal in mind.” Further, Plyler feels that the contest is appealing because “it’s a great opportunity for MAU employees to join together and have fun- oh yea, and the money”, he said! MAU Workforce Solutions President Randy Hatcher is always looking for great ways to promote healthy habits among the employees of MAU Workforce Solutions. “I am so excited to see so many MAU employees taking such a big “step” in improving their health by training for the Bridge Run,” said Hatcher. At MAU, we are counting down the days until the Cooper River Bridge Run! Hatcher is especially excited to join together with thousands of individuals for this fun, fitness oriented event. “40,000 people and me…I can’t wait to feel the energy at the starting line,” he said. Prizes will be awarded to the first three participants who complete the Cooper River Bridge Run ahead of MAU Workforce Solutions President, Randy Hatcher. MAU will all reimburse up to 50 MAU employees for their race fee, and provide a team shirt to be worn the day of the race. Please Note: This contest only applies to MAU Workforce Solutions employees.